One of my most anticipated films for 2016 was the Tarzan adaptation distributed by Warner Bros. and directed by ‘Harry Potter and the Deathly Hallows Part 1 & 2‘ director David Yates. Due to the incredible work Yates did with the Harry Potter franchise I was eager to see what he did next and the cast consisting of Alexander Skarsgård, Margot Robbie, Christoph Waltz, Samuel L. Jackson & John Hurt definitely got me hyped. The poster’s pretty good. It’s a bit murky for my taste but the image of Tarzan played by Alexander Skarsgård (‘True Blood‘) side by side with the screaming Ape shows that he’s one with these creatures. As for the teaser trailer, honestly it left me rather underwhelmed and rather confused. At first it looks like what you’d expect from a live-action 2016 adaptation of Edgar Rice Burroughs’ books, though it seems to have ripped many elements straight out of Peter Jackson’s ‘King King‘ remake, including their smoke-machine. We have a baby that is raised by Gorillas so he becomes one with the Animal Kingdom. But the first odd element comes 15 seconds in. Who the hell are these folk? There are shots peppered throughout the film of what look to be tribesmen in the Jungle where Tarzan came from. If that’s the case…what’s so unique about Tarzan? Isn’t the whole point of the material that he’s the lone human in an animal world? Isn’t THAT what makes him stand-out? Isn’t that what gives him his inner conflict when humans eventually DO arrive? And then at the end of the trailer, it drops something that makes things even more confusing; that we have a civilised Tarzan in England who seems to be some sort of a celebrity. What is this movie? An origin story? A sequel? A re-imagining? What? Well, the plot synopsis explains that ‘The Legend of Tarzan‘ centres on Tarzan long after he’s already left the jungle and is with his girlfriend Jane, played by Margot Robbie (‘The Wolf of Wall Street’ & ‘Suicide Squad’) after adapting to a normal London life and that he has to go back to the Jungle act as a trade emissary. But you wouldn’t know any of that from watching this teaser. It just comes across as jumbled and will more than likely confuse audience members. I know it’s a teaser, but when you’re dealing with a property as recognisable as Tarzan and you’re doing a twist on the story…you can’t sell both the original AND the twisted version without explaining yourself because you’ll just confuse people. That having been said, the scope of the movie looks very impressive with this teaser hinting at numerous set-pieces and lots of animal interactions. We have Christoph Waltz hamming it up as the villain (Who will be more bombastic? Him or Brian Blessed from the Animated Disney version?) and who knows if Alexander Skarsgård will do a good job with his performance but he definitely looks the part. I just feel like this teaser trailer bit off way more than it could chew. The special effects don’t look very good and while you can guarantee they’ll be improved by the time this movie gets released next Summer, why show them at all if they weren’t in a good enough state? I want to have faith in David Yates and he’s clearly a great technical director but this trailer isn’t really doing him many favours. The shot of Tarzan jumping at 1:18 gave me ‘Tarzan 3D‘ flashbacks and that ain’t a good thing. Hopefully the next trailer we have will have a more coherent narrative to it and will improve on the unfinished effects. This movie was one of my most anticipated for next year but after this trailer, it’s probably left my Top 10. 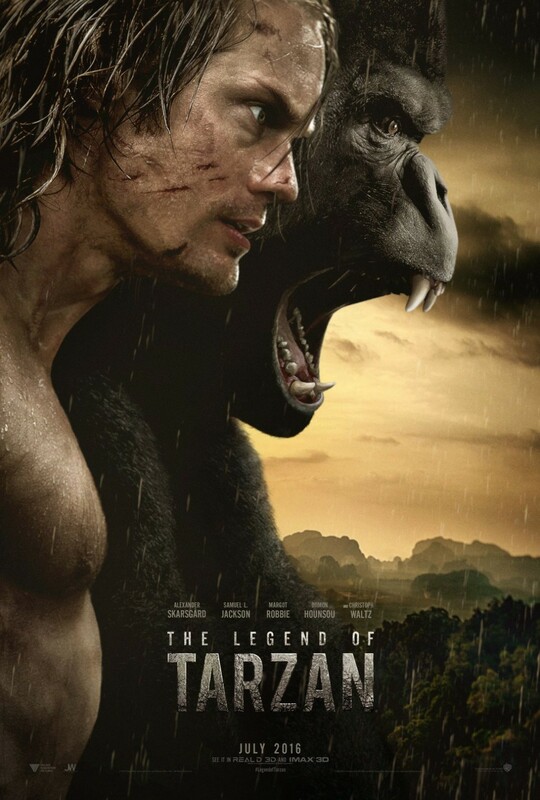 ‘The Legend of Tarzan‘ will be released in the U.S. on July 1st 2016 and in the U.K. on July 8th 2016.